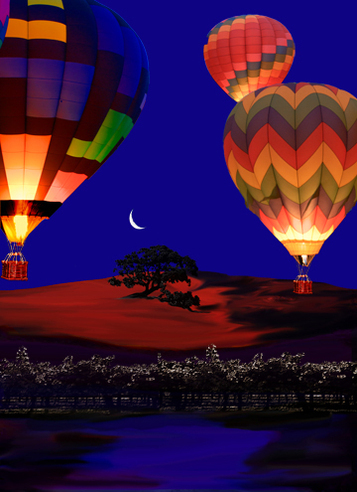 ﻿﻿﻿﻿In the darkness of night, hot air balloons float above the earth. The bright orbs light glow in the sky before the sun rises. Have you ever seen a hot air balloon? Would you like to take a ride in one? Do you wonder what keeps them aloft, or what it feels like to sail on the wind? ﻿﻿The first hot air balloon was launched in 1893 carrying a sheep, a duck, and a chicken. They floated around for about 15 minutes before landing safely. About two months later, the first human ascended in a balloon - their flight lasted about 20 minutes followed by a successful landing. The hot air balloon, an aircraft called an aerostat, was the first vehicle in which human’s flew. The first aerial photograph was taken from a hot air balloon by Felix Nadar, who went on to build an enormous balloon named Le Geant that inspired Jules Verne's novel Five Weeks in a Balloon. Hot air balloons also inspired adventurers, who sought to make and break records flying balloons over mountains and oceans, across the earth and into the stratosphere.